- Cast on 15 stitches, join in the round (being careful not to twist the stitches) and knit each round for 19 rounds. ****At this point, I take the tail and weave it through the 3 stitches that are on the needles and then pull it down the center top of the candle so it is on the inside of the tube for the candle, making sure to keep those 3 stitches on the needles because you'll need them to make the flame with. - knit 2 together around (3 stitches), removing each dpn as you go until all 3 stitches are left on 1 dpn. 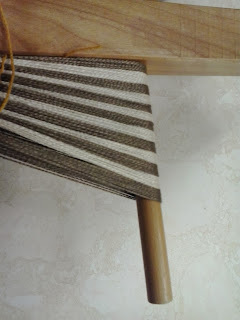 - cut yarn, leaving 4 - 5" long tail (probably overkill on how long the tail should be, but I don't like having too short of a tail when I'm doing the finishing work on a project), thread darning needle with tail. Insert darning needle in stitch furthest from stitch with the tail. Slip the stitch from the dpn onto the darning needle, repeat with the other 2 stitches on the dpn. Pull the darning needle and tail through all 3 stitches, pull tight, tie a knit (making sure that it is as close to the tip of the flame as you can get). Now, take the darning needle (with the tail yarn still threaded in it) and put it down the tip of the flame, through the bottom of the flame into the candle so that the tail from the flame yarn is on the inside of the tube for the candle. 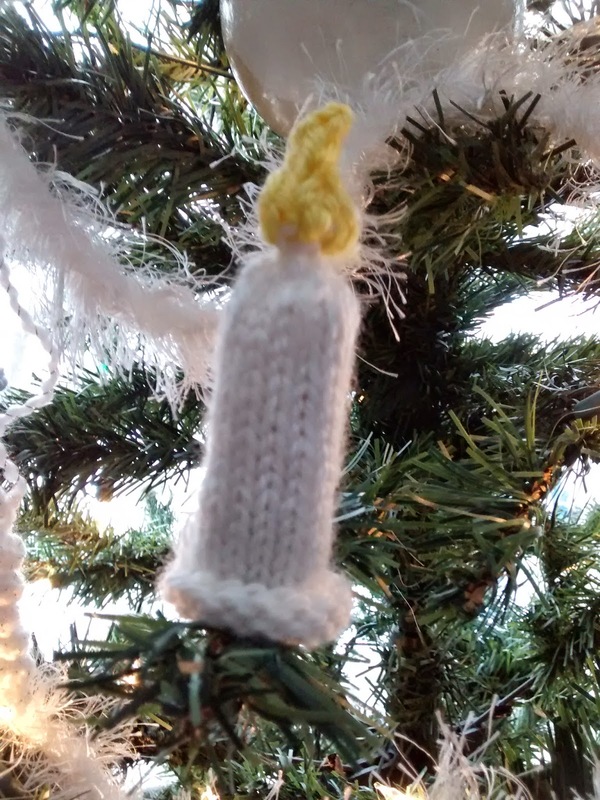 Remove the darning needle, trim the tail (from both the candle yarn and the flame yarn) & insert the clothes pin (handle will be closest to the flame). Place candle on tree by squeezing the sides of the candle to open the clothes pin, place on tree branch and let go of candle. Thursday of last week I took my loom to weaving & started getting a new warp wound to put on it. I had bought some cones of 100% cotton & I'm planning on weaving some dish towels. 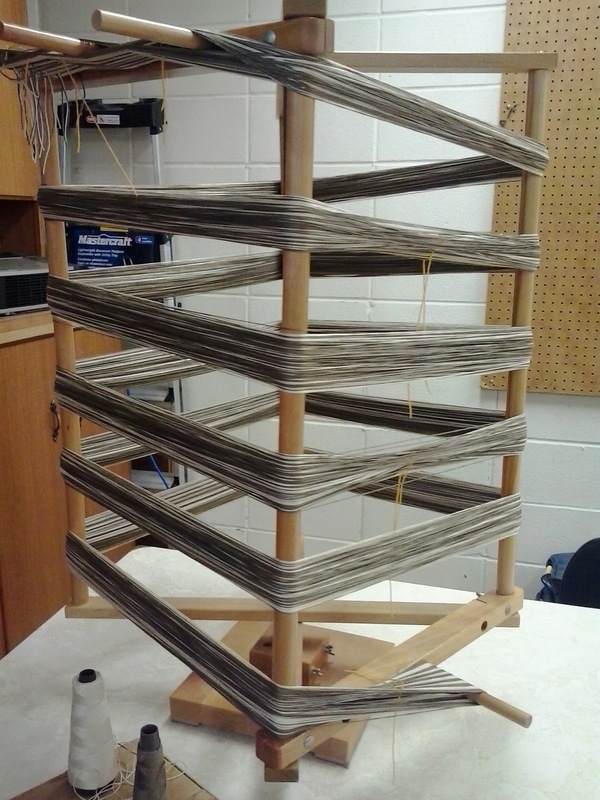 This Thursday coming up, I'll need to finish winding the warp, and then I can start putting it on the loom. 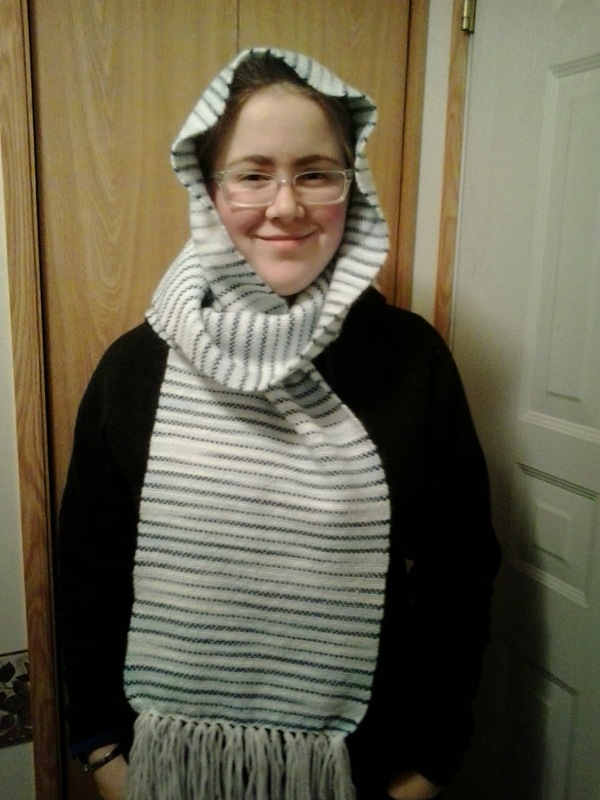 I finished making the hooded scarf on my small rigid heddle loom ..... it turned out exactly as I had imagined it would. We gave it to my Mom for Christmas - haven't heard how she likes it. 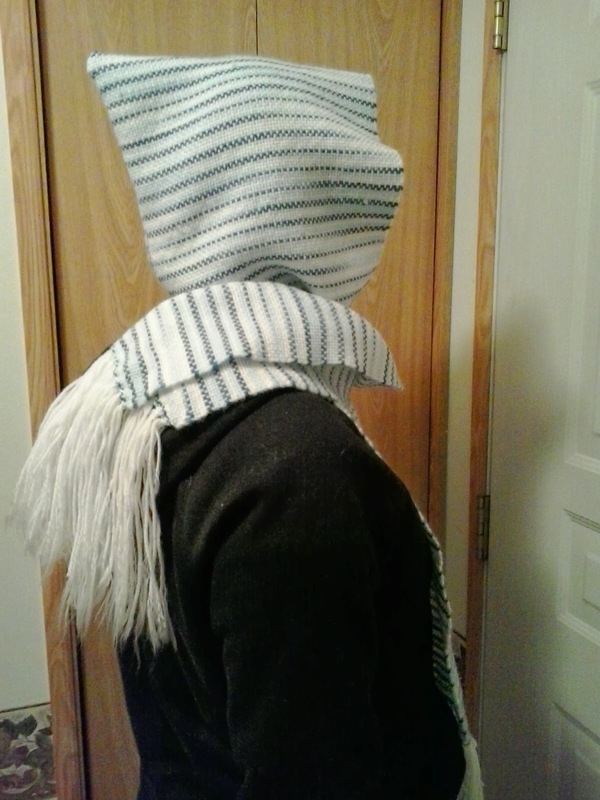 Today I started weaving a hooded scarf .... I'd been envisioning how this would look and I have to say, it is exceeding my expectations on how it looks, lol. 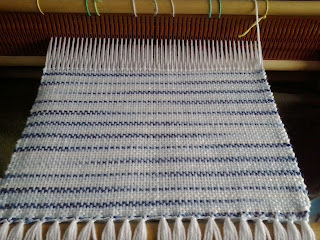 The warp is white Red Heart Super Saver and the weft is a white & blue variegated yarn (same weight as the warp, just don't know the brand). 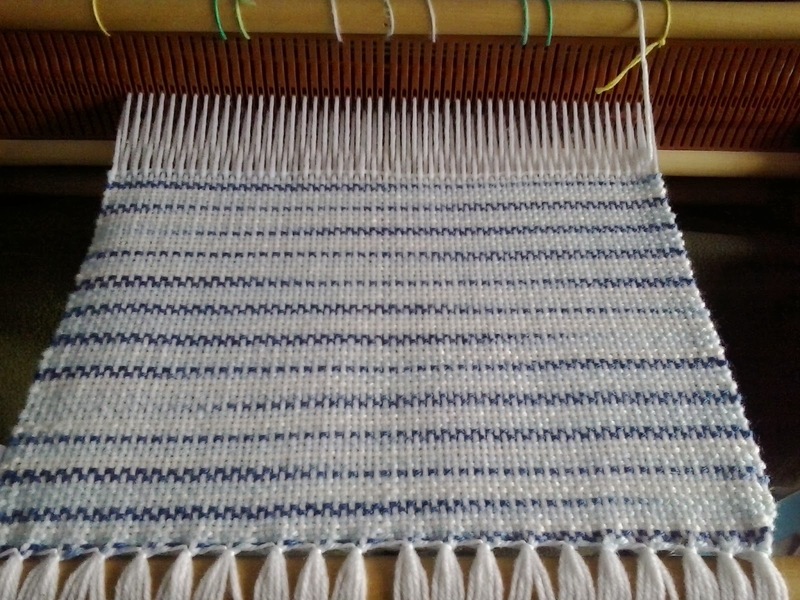 The width, on the loom, is 11 1/8" .... not entirely sure how long it will be once it's finished. I don't have a recipient in mind for it, yet ..... not sure if it will be a Christmas gift, if I'll keep it, or if I'll give it to Charlotte (like she's been hinting at since she's seen it, lol).